This was a cheeky gift to myself in my hour of need. My favourite aspect of this is the cooling menthol ingredient, it tingles your lips and feels as though the healing ingredients are getting to work . It is really thick so it’s best to tap it on to your lips rather than try to smooth it on, it also can provide a dewy glow to your cheeks. Although it’s pricey if you are willing to pay a little extra for something luxurious then this is for you. I first encountered this when my friends brought some back from their travels around Australia, it then became the custom to place an order with the next person to visit Oz. This ‘ointment’, as they call it, is very similar to Elizabeth Arden’s Eight Hour Cream but without the bizarre smell, it has the same dense texture and works on all body parts not just your lips. It also lasts a ridiculously long time, a tube that I got from a visit to Australia would last me about a year till someone else went over there. Good news though, you can now buy it over in the UK so you don’t have to wait so long. This is a much lighter and thinner balm, it has a silky texture with a gentle sugary exfoliation which is great to rid your lips from the dry flakes. The only down side, and I realise this will sound odd, is the taste. I know you shouldn’t taste lip balms but that’s the point after applying this a few times I get an odd after-taste. This is the cheapest of the bunch, it glides on easily and is flavoured with Vanilla extract. It also has a high sun protection factor of SPF30 making sure that your lips are safe in the sun. One word of warning, when you apply too much your lips do become white, I made this mistake when I was out and only realised when I popped to the loo. 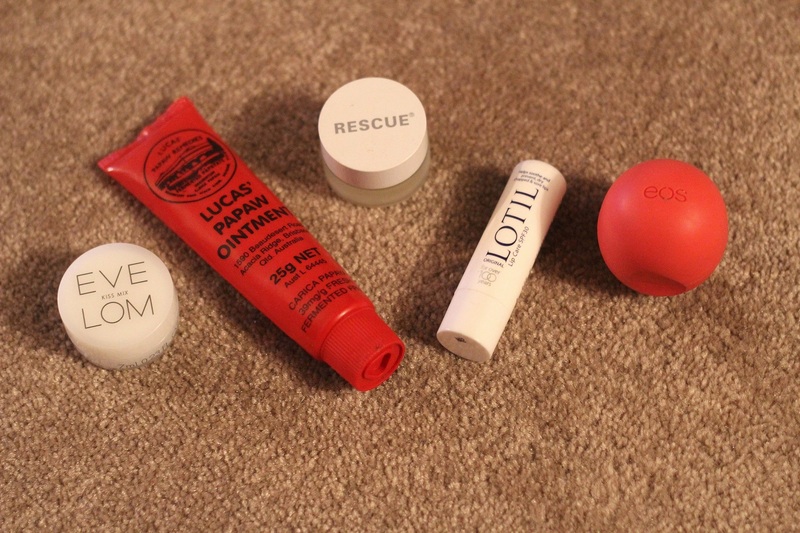 As you may know I am a massive fan of EOS, I love the little egg as though it were my friend (hmm ok that’s weird), it is a brilliant lip balm, thoroughly moisturising and so easy to apply. However, I think it is best used on lips when they are slightly dry, as my lips have been extremely dry this wasn’t as nourishing as the papaw. …And finally, as I said I really did try everything, a home remedy that helps smooth your dry lips is honey and sugar. just mix about a tablespoon of honey with some sugar and rub it on your lips for a tasty exfoliation. What is your go-to lip saviour?